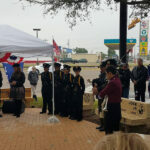 The Veterans Day Celebration was brought to you by a partnership between the La Feria Veterans Memorial Committee and La Feria Area Chamber of Commerce. 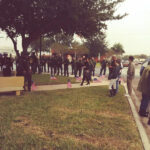 About 150 people attended the celebration honoring the veterans. 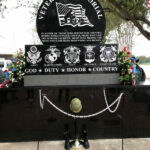 The La Feria Veterans Memorial Monument is a place of pride, reverence and remembrance. 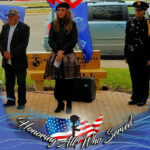 It is a dedicated tribute to the men and women who have served or are currently active in every branch of the United States military. 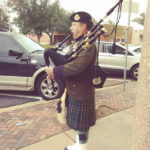 Thanks to our soldiers, defenders of America’s public lands and freedom. 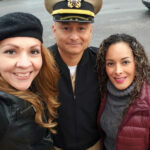 They belong to everyone in our country because of you. 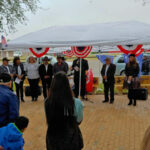 The Veterans Day Ceremony and Dedication was organized by volunteer lead director Alma Martinez- Botello representing The La Feria Area Chamber of Commerce and The La Feria Veterans Memorial Monument Committee. 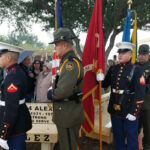 Special Recognition: In Memory MIA Korean War SGT Tommy De La Pena from La Feria; In Memory of Marine and Border Patrol Agent Javier Vega Jr.; In Memory of War Hero Senator John Sidney McCain III; Honoring WWII Veteran Juan A. Perez. 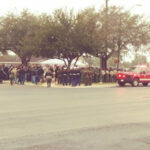 La Feria I.S.D. 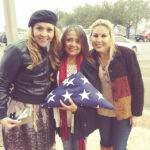 ; La Feria Area Chamber of Commerce; La Feria Veterans Memorial Committee; La Feria American Legion Post 439; South Texas Collaborative for Housing Development, Inc.; South Texas Emerging Markets Development Fund, Inc.; La Feria High School Color Guard; La Feria High School TAPS; Noemi Dominguez Elementary; William B. 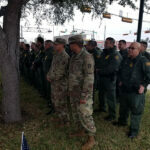 Middle School; Tony’s Flower Shop; El Centro Foods; Golden Corral in Harlingen; Keith Grayson; Javier Vega, Jr. Family; Jose Almanza; Sunny K. Philip; Christine Philip; Mark Burus; Ignacio Garcia; Basilio Rosales; Maria N. Ricon; Cameron County Constable Pct. 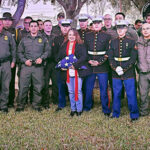 5 – Eddie Solis; US Marine Corps Reserve; U.S. Border Patrol; Office of United States Senator John Coryn; State Representative Oscar Longoria District 35; and Alma Martinez-Botello. We would like to recognize those who have served: Alberto Anzaldua, Kimberly Bacon, Paul A Bauer, Anzelmo Bazaldua, George V Bowers, Jaime Bruno, Jose G Cabrera, Lorenzo Campos, Benito Canales, Arturo Castillo, Benito Contreras, Herman V Contreras, Eliberto Contreras, Juan R Contreras, Joseph E Contreras, Patricio Contreras Jr, Domingo Cortez, Hector Cortez, Nick Counelis, Manuel DeLaCerda, Tommy DeLaPena, Reymundo DeLuna, Juan J Diaz, Dave Dutch, Daniel J Elizondo, Gilberto Elizondo, Eugene Eubanks, Javier F Flores, Jose A. Flores Jr, Jose A Flores Sr, James D. Foster, Jerry L. Fuller, Larry J. Fuller, Ralph J. Fuller, Natalie Galvan, Armado Gamez, Leandro Gamez, Candelario Garcia, Julio Andrew Garcia, Alberto Gonzales, Alex Gonzalez, Orin Goulding, Rolando Guajardo, Tony Guevara, Carie Suzanne Guillen, Alfonso Guillen Jr, Demetrio Gutierrez, Lorenzo Gutierrez Jr., Santos Guzman, Keith Grayson, Kristian Hayes, Raul V Hernandez, John Hernandez Jr., John Hernandez Sr., Armon Hetzel, Darold G Hoff, Mike Hoff, Matias Jimenez, J. F. Kennedy, Andres Levrier, Aniceto “Cheto” Lopez, Juan Loredo, Eric A Loya, Jose Loya Jr., Jesse A Madaffari, David Magnuson, Frances Maples, Rudy Mares, John D Martinez, Juan M Martinez, Senator John McCain, Moses Mendoza, Benito Munoz Jr., Robert Munoz Sr., Allen Payne, Dominic Perez, Frank X Perez, Jose JC Perez, Baldemar Puente, Daniel Allen Purcell, Doug Purl, James D Purl, Arturo Rangel, Sotero Reyes Jr., Tommy Riedel, Jose Luis Rios Jr., Miguel A Rivera, Pedro Rivera Jr., Juan Rodriguez, Ana M Rodriguez, Isreal Rodriguez, Juan Rodriguez, Juan D Rodriguez, Juan M Rodriguez, Luis Rodriguez, Ramiro B Rodriguez, Steve Rodriguez, Joel Rodriguez, Manuel Rodriguez, Gabriel Rodriguez, Andy Rogers, Alberto Rosales Jr., Erica T Rubio, Arturo Salas, Ariel Salas, Tina Saldana, Alberto I Sanchez, Don Schwanke, Jose Martin Serrata, Ivan Serrata, Raul V Serrata, Thor Smalling, Lalo Sosa, Hector F Taguilas, Lee Tomelloso, Adolfo Z Torres, Joel Torres, Ramon Torrez, Enrique Treto, Belen R Turner, Desi Valdez, Belinda Varner, Juan D Vasquez, Silverio Vasquez, Javier Vega Jr., Ciprian D Vento, Glenn D Warren, Gloria Sandoval Weaver, Kenneth W Webb, David Williams, Larry J Williams, Tyler Wychopen, and Peter Zambrank.